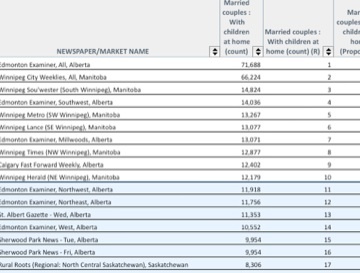 Using 10 of the approximately 10,000 available datasets, AdCanada Media's GIS application was used to match a list of client target criteria to newspaper coverage area. In this case the target criteria included: married couples with children at home and married couples with no children at home. The agency for a large agricultural implement manufacturer was planning a campaign in areas with high farm count concentration as the primary consideration. Secondary criteria for the project called for reach into acreages, hobby farms and small ranch operations. 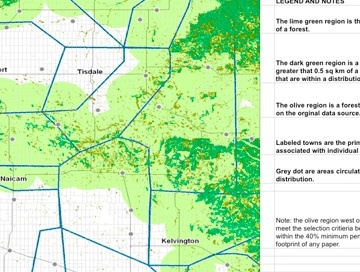 AdCanada Media's GIS application allowed for the alignment of target criteria with coverage areas highlighting appropriate newspaper/market options. The agency was looking to build a plan around publications circulating in areas of heavy forest concentration. 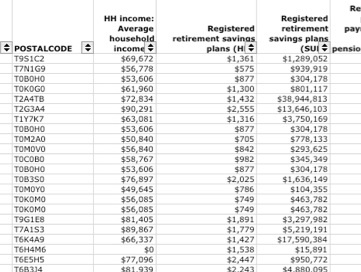 They needed further insights into data that existed only in raw table form. AdCanada Media's GIS infrastructure allowed their data to be physically plotted for deeper analysis and perspective. The map illustrates location and density of forest and newspaper coverage area. The accompanying table (not shown) delineated square km's of forest (and forest type) within a 10km radius of each newspaper coverage area. The agency was planning a recruitment campaign targeted at individuals currently employed in oil and gas mining in the Edmonton area. Use of GIS technology and thermal density mapping, we were able to illustrate geographic 'hot spots' for the occurrence of the target. In this case we density mapped StatsCan Census data for Labour Force by Industry: Mining Oil and Gas. Interactive Density Maps and tools are currently available for 24/7 use by planners here. 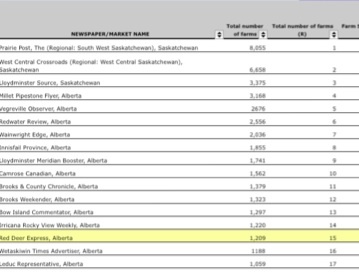 StatsCan data and the AdCanada Media GIS system was used to highlight a collection of 'best bet' markets/newspapers for an agency specializing in HR and recruitment. 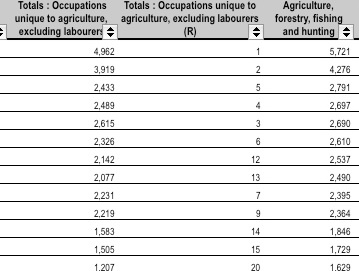 Targets criteria was Occupations Unique to Agriculture and Occupations Unique to Forestry, Fishing/Hunting respectively. Information was provided to the client as population counts by newspaper coverage area. The agency simply built the campaign around newspapers with the highest population counts for the target occupation. The agency was able to supply a list of retail locations (by address and postal code) and a set of target criteria that included high annual HHI and RRSP expenditures. 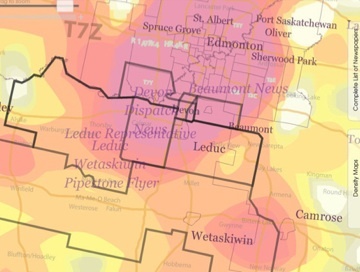 AdCanada Media's GIS was used to integrate data from multiple sources and in various forms to create a one to one connection between the target audience and most appropriate newspaper. The result was a listing of publications defined in two ways; by the retail locations captured in the coverage area and then by the value of the coverage area relative to the income and expenditure criteria. The data allowed the planner to understand the duplication in coverage for each location and offer a way to identify the most appropriate newspaper option in all cases.